The electrical field and charge are also influenced by where live and in what conditions, it is possible for these factors to upset the natural balance. Before Dr. Alfred Vogel, Dr. Harold Saxton-Burr proposed „the electro-dynamic theory of life”. These were the statements of Dr. Harold Saxton Burr, Ph.D., who was E. K. Hunt Professor Emeritus Anatomy at Yale University School of Medicine. Dr. Burr was a member of the faculty of medicine for over forty three years. From 1916 to the late 1950’s, he published, either alone or with others, more than ninety-three scientific papers. Dr. Burr discovered that all living things – from men to mice, from trees to seeds – are molded and controlled by „electro-dynamic fields,” which could be measured and mapped with standard voltmeters. In some cases it has been definitely shown that these field extend beyond the organism. Dr. Burr believed that, since measurements of L-field voltages can reveal physical and mental conditions, doctors should be able to use them to diagnose illness before symptoms develop, and so would have a better chance of successful treatment. A ‘battered’ L-field – that is, one with abnormal voltage patterns can give a warning of something ‘out of shape’ in the body, sometimes in advance of actual symptoms. For example, malignancy in the ovary has been revealed by L-field measurements before any clinical sign could be observed. Dr. Burr decided to examine the electrical properties of cancer-susceptible mice to determine if the voltage measurements would change during the initiation and growth of cancer tissue. „The results of the experiment were surprisingly consistent. Twenty-four to twenty-eight hours after the implantation, changes were observed in the voltage gradients. One of Dr. Burr’s most exciting discoveries dealt with the recording of voltage changes during female menstrual cycles. „They hit on the idea of using a female rabbit because it is known that rabbits ovulate about nine hours after stimulation of the cervix. So a rabbit was stimulated and nine hours later was anaesthetized. After connecting the electrodes and watching through a microscope, suddenly it happened to the awe and delight of the scientists: at the moment when through the microscope they saw the follicle rupture and the egg released, there was a sharp change in the voltage on the recorder. „Shortly after this, a young woman had to have an operation and volunteered to let this be done, when her electrical records indicated that ovulation was imminent. When her voltage gradients started to rise, she was taken to the operating room and an ovary uncovered. A recently ruptured follicle was observed – which confirmed the findings in the rabbit. Even Earlier Than Dr. Harold Saxton Burr – Dr. Max Planck Proposed; „Everything Oscillates”. Max Karl Ernst Ludwig Planck was born in Kiel, Germany, on April 23, 1858, the son of Julius Wilhelm and Emma (née Patzig) Planck. His father was Professor of Constitutional Law in the University of Kiel, and later in Göttingen. Planck studied at the Universities of Munich and Berlin. He was Associate Professor of Theoretical Physics at Kiel until 1889. Afterwards he became President of the Kaiser Wilhelm Society for the Promotion of Science, a post he held until 1937. The Prussian Academy of Sciences appointed him a member in 1894 and Permanent Secretary in 1912. The problems of radiation processes engaged his attention and he showed that these were to be considered as electromagnetic in nature. Planck was able to deduce the relationship between the energy and the frequency of radiation. The energy for a resonator of frequency v is hv where h is a universal constant, now called Planck’s constant. This was not only Planck’s most important work but also marked a turning point in the history of physics. The importance of the discovery, with its far-reaching effect on classical physics, was not appreciated at first. However the evidence for its validity gradually became overwhelming as its application accounted for many discrepancies between observed phenomena and classical theory. Among these applications and developments may be mentioned Einstein’s explanation of the photoelectric effect. The main reason for the recent change in outlook is the development of sensitive instruments that can detect the minute energy fields around the human body. Of particular importance is the SQUID magnetometer (4), which is capable of detecting tiny magnetic fields associated with physiological activities in the body. It has long been known that each organ in the body generates characteristic electrical fields that can be detected on the skin surface. But the laws of physics state that any electrical current is accompanied by a corresponding magnetic field in the surrounding space. In the early 1970’s, scientists at MIT, using SQUID magnetometers, confirmed the heart studies, and detected the much smaller fields around the head that are produced by brain activities. Subsequently, it was discovered that all tissues and organs produce characteristic magnetic pulsations, which have come to be known as biomagnetic fields. 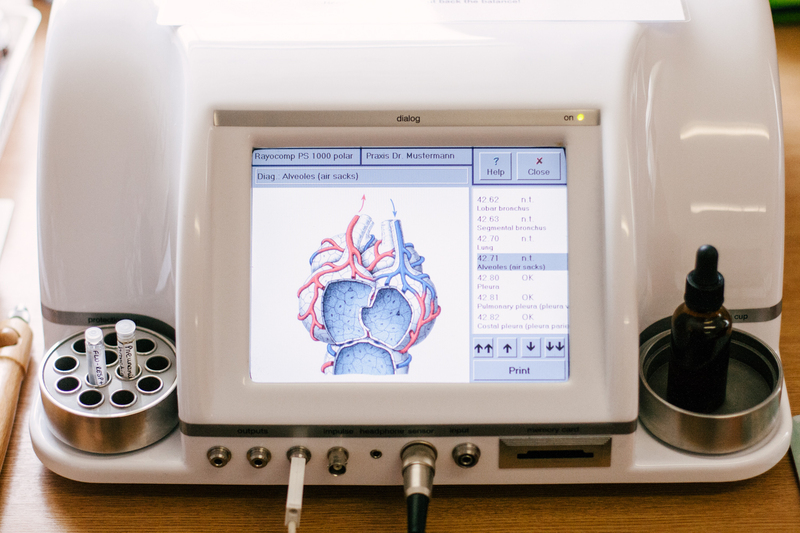 The traditional electrical recordings, the electrocardiogram and electroencephalogram, are being complemented by biomagnetic recordings, called magnetocardiograms and magnetoencephalograms, respectively. Remarkably, Italian scientists have found that living tissues have the same electronic circuitry that is used in the SQUID. Three kinds of bioenergetically active signals are present in the earth’s natural environment: Schumann waves, geomagnetic waves and solar waves (see W. Ludwig: Informative Medizin. Essen 1999 it may be obtained by contacting AMS GmbH). At about 100 kilometres above the surface, the earth is surrounded by the ionosphere. The vast space between the ionosphere and the earth’s surface acts as an enormous electromagnetic resonance cavity, like the sound box of a musical instrument. These resonating electromagnetic waves are known as Schumann waves, after their discoverer, the physicist W.O. Schumann. The basic waveform (first harmonic) has a frequency of 7.8Hz exactly the same frequency is present in the main control centre of the human brain, the hippocampus/hypothalamus. The earth’s crust contains 64 elements which are vital as the so-called trace elements. Each of these trace elements possess it’s own characteristic types of vibration. The earth’s magnetic field is influenced or modulated by these vibrations, the resulting modulation being known as geomagnetic waves. The earth’s crust contains the same essentially vital mineral material (trace elements) as those existing in the red blood corpuscles of humans. Dr Wolfgang Ludwig discovered that an imbalance of Schumann and geomagnetic waves induce micro-stress in living creatures… On the basis of the research work of Dr Ludwig, NASA constructed Schumann wave frequency generators in it’s manned satellites…. The past century has witnessed extensive human interference in the natural environment. Many human activities have altered the natural electromagnetic and geomagnetic environment. For instance, the lowering of the water table, the insulating effect of asphalt, and the screening effect of buildings made of metal reinforced concrete have all contributed to the weakening and distortion of both Schumann and geomagnetic waves. These natural frequencies are superimposed, distorted or even disturbed by artificially produced frequencies resulting from radar, radio, TV stations, mobile phone signals as well as from nearly all electric and electronic working and household devices. Can electromagnetic fields (EMF) …cause brain tumors, leukemia, birth defects, miscarriages, chronic fatigue, headaches, cataracts, heart problems, stress, nausea, chest pain, forgetfulness, cancer and other health problems? Dr. David Carpenter, Dean at the School of Public Health, State University of New York believes it is likely that up to 30% of all childhood cancers come from exposure to EMFs. The Environmental Protection Agency (EPA) warns „There is reason for concern” and advises prudent avoidance”. In addition to the long term health concerns, buying a house with high fields will be an economic disaster. In a few years, when power line radiation is as well known as asbestos and radon, a house with high fields will be practically impossible to sell. Already there are hundreds of lawsuits regarding EMFs and property devaluation. An enormous amount of electricity is created at power generating stations and sent across the country through wires that carry high voltages . All power lines radiate electromagnetic fields. A substation is an assemblage of circuit breakers, disconnecting switches and transformers designed to substations have been blamed for causing cancer clusters among nearby residents. Paul Brodeur rote about several such cancer clusters in the July 9, 1990 issue of the New Yorker Magazine. Many people don’t realize that when they see a transformer, the power line feeding the transformer is 4000 to 13,800 volts. If your home has high EMF readings, it is important to determine the sources of the EMF so that remedial action can be taken, if possible. Many times a particular room will have a higher EMF reading. Check to see if the electricity is coming into the house on the wall outside that room. EMFs radiate from all sides of the computer. Thus, you must not only be concerned with sitting in front of the monitor but also if you are sitting near a computer or if a computer is operating in a nearby room. Electric blankets create a magnetic field that penetrates about 6-7 inches into the body. Thus it is not surprising that an epidemiological study has linked electric blankets with miscarriages and childhood leukaemia. This pioneering work was performed by Dr. Nancy Wertheimer and Ed Leeper, who originally discovered that magnetic fields were linked to childhood leukaemia. Similar health effects have been noted with users of many electric blankets and waterbed heaters will emit EMFs even when turned off. The devices must be unplugged to delete the EMF exposure. Electric clocks have a very high magnetic field, as much as 5 to 10 mG up to three feet away. If you are using a bedside clock, you are probably sleeping in an EMF equivalent to that of a powerline Studies have linked high rates of brain tumours with chronic exposure to magnetic fields, so it is wise to place all clocks and other electrical devices (such as telephones and answering devices) at least 6 feet from your bed. Telephones can emit surprisingly strong EMFs, especially from the handset. This is a problem because we hold the telephone so close to our head. Answering machines, particular those with adapter plugs (minitransformers), give off high levels of EMFs. Why are there still reports of experiments indicating no harm resulting to humans or other creatures? It may be as one researcher stated: „Unfortunately, almost all of the research work that is currently in progress, as well as most of the surveys of existing literature, is directly or indirectly financed by the electric industry. It would be unrealistic to expect that results emerging from this industry-funded research would present an unequivocal case against the big transmission lines.” She then drew a comparison with the tobacco industry’s funding research to prove that cigarette smoking isn’t harmful, even though scientific medical research has produced abundant evidence to the contrary. Interestingly, Environment magazine of November 1978 lists a summary of 45 scientific researches done by various universities and research institutes. All, without exception, demonstrate adverse effects of power-line radiation on animals as well as humans. University of Colorado medical researchers found that the death rate for certain cancers, such as leukemia, was higher than average in homes within 130 feet (40 m) of high-current power lines. Ref: Awake 1984 4/22 15 How Harmful Is Electric Smog? The rattlesnake is able to detect a difference of 0.01 degrees in location of prey. The whale is able to detect a difference in field strength of 1 x 10E -8 Volts/cm. It is now known that the organism is able to read ultrafine signals from out of the noise level. Sharks are able to sense the minute electrical fields that emanate from fish. Bees and Trout have demonstrated the ability to detect magnetic fields. It is now well established that some organisms use the Earth’s magnetic field as their guidance. For instance, in 1957 Blakemore found that certain aquatic bacteria (magnetotactic) and tend to swim along the field lines of the Earth’s magnetic field. However, since 1975 it has been found that many other organisms also use the Earth’s magnetic field for navigation. These organisms are: honeybees, homing pigeons, dolphins, whales, butterflies, tuna fish etc. The organisms have magnetite (lodestones)in the form of Fe3 O4 an oxide of iron in their brain or abdomen that can help them to sense the Earth’s magnetic field. Dangers Of EMF’s, Mobile Phones And Masts How They Can Affect Our Health. The Human Body contains electrolytes and ions, which are positively or negatively charged. The water molecule is a polar molecule – it has positive and negative charges separated by a dipole length. A water molecule has a positive and negative pole and is therefore, an electric dipole. As we are made up of approximately 65-70% water, electrolytes and ions, it follows that the human body has its own weak electromagnetic field and each of our cells has its own EM Field too. Basic science shows us this is so. It follows that strong and even weak Electromagnetic Fields emitted from any electrical or electronic equipment will interact with and affect the human body’s own weak electromagnetic fields, and, therefore, interfere with the body’s natural healing processes. against any future potential liabilities. Our nervous system also responds to the electromagnetic pulses of the Schumann waves. These induce miniature potentials in the nerve loops, which on repetition add up to action potentials and can actively intervene in cybernetic control circuits of the body. The autonomic nervous system is autonomic but adapted to the environment and resonates with it. It becomes very clear that we are an electrical or energy system and depend on and interact with balanced and natural energies around us for our health, well-being and survival. The importance of this and the importance of the Earth’s Schumann waves, as an example, are evidenced by the fact that NASA builds Schumann wave generators into its manned space flights to keep their astronauts physiologically and psychologically healthy. The body does not become ill because it has been infected but because the defence system – the energy field – has become weakened. Professor Popp discovered that the cells of living organisms store and emit light (photons) and this light controls vital processes. If this mechanism does not function correctly, the organism is diseased. It has been established that there is a constant equilibrium between photons and the growth of a cell association and if the EM field of the cell is disturbed its coherence (balance) is affected too and if this coherence is disturbed, all the functions, including immune defence, are blocked; but above all – and this is the most important thing – the repair capacity of the cell, the ability to restore order to genetic damage is blocked. From this point of view the concept of disease should be reconsidered: disease, before it is manifested in physical symptoms, is manifested as a disturbance in or to the electromagnetic field. „Light or energy within the cells of living organisms regulates cell growth, ensures the exchange of information mutually between the cells…disease occurs through a disturbance of the electromagnetic field in the cell: it becomes disordered and incoherent. Every kind of frequency combination, which is not in order, produces disease. From the point of view of disease, the disturbance of biochemical sequences in biological systems can be regarded as a disturbance to the order of electromagnetic oscillations in the body, triggered by exogenous and endogenous influences. Many years of solid research have proven that this is so.” These research results run ‘counter to the widespread belief that biochemical processes are causal.’ This is not so. It is apparent from the science of biophysics and the understanding that we humans are an open ‘radio system’ made up of varying electromagnetic frequencies that we naturally interact with all external energies, natural and man-made, and these energies do play a large part in our health and well-being. When we interact with natural and balanced energies, such as Earth energies like Schumann waves, we are reinforcing the natural balance within our own energy system, our cells and our DNA. Robert Becker had done a series of experiments beginning in the 1950s showing that the body of all organisms has a Direct Current (DC) field, and that electric currents produced all over the body are involved in controlling growth and regeneration. By the 1960s, Becker had already proposed that an electrical communication system exists within all living things, and demonstrated that externally applied fields could influence the processes of growth and regeneration. These fields are in addition to the now well-known and accepted electrical activities of the brain that can be measured as electroencephalograms (EEG) and in the pacemaker of the heart as electrocardiograms (ECG). Electrical activities and ionic currents have also been measured in cultured cells and tissues. And the weak magnetic fields generated by current flows all over the body can now be measured non-invasively with the extremely sensitive Super Quantum Interference Device (SQUID) magnetometer. The evidence is overwhelming that electro-dynamical fields and currents are involved in intercommunication within the body. These fields and currents are connected to and correlated with the EEG and ECG that are a routine part of conventional biomedicine. Bio Resonance Therapy And The Russian Space Programme, FDA, Etc. During the last years of the Soviet era the Russian space programme concentrated on sending men into space for long periods of time, often for many months. One cosmonaut stayed in space for longer than a year. These cosmonauts were in space with no access to medical attention. The fact that all water (including urine) was recycled on vehicles such as the Mir Space Station meant that chemical-based medicines and conventional drugs could not be used as even a single aspirin, if taken by one of the crew, would stay in the water supply for ever as it would be excreted and then recycled. therapy they developed a device called the Skenar or the Kosmed. This is a small, hand-held, computerised electro-therapy device of great sophistication and power. The machine puts an electric impulse into the body, reads the impulse coming back from the body, and then alters the next impulse it puts out. This is repeated until the body reaches a state of electrical normality. The device started life as a top secret space project but is now widely used in hospitals in Russia. Most Russian ambulances carry them. They are becoming increasingly used by practitioners of Biological Medicine in the West. Another top secret Russian space project involved the use of Extremely High Frequency (EHF) electro-magnetic radiations in the millimetre wavelength band as a means of space communication. It was accidentally discovered that such radiations had a beneficial effect on human health. This led to the invention of a machine that puts such radiations into acupuncture points. These frequencies are the same as those used by the acupuncture points themselves and are similar to the radiations emitted by homoeopathic medicines. Dr. Valerie Free, in her book, Orthopedic Energy Goes Mainstream, shows that in the 1960s and 1970s electrodes of direct currents were used to stimulate the growth of exposed bone or were implanted to stimulate bone growth. In the 1970s Drs. Andrew Basset and Robert Becker showed the possibility of stimulating bone growth with pulsed electromagnetic fields. From the 1970s through the 1990s, scientists in Eastern European countries tested static permanent magnetic devices to stimulate bone tissue, to treat non-union fractures, and to help conditions such as osteoporosis and osteonecrosis. In 1994 the FDA approved a vibrational resonance device patented by Liboff, McCloud and Smith. This bone-healing device transmits the vibrational resonance of potassium, magnesium and/or calcium in the 200 to 400 milligauss range together with a pulsed electromagnetic field (PEMF). In 1994 the FDA also approved the Sonic Accelerated Fracture Healing System (SAFHS), which emits ultrasound pulses at about the same low intensity as sonogram fetal monitors. In this new millenium, energy devices of different wavelengths, amplitudes and frequencies will have the ability to stimulate the body’s natural bone healing mechanisms. Bio Resonance therapy is supported by scientific studies, numerous letters from cured patients, case history studies, reports and books. In one clinical study by Dr Peter Schumacher of 200 people, 83% of those who received bio resonance treatment no longer had any allergic reaction to the offending allergen. An additional 11% were greatly improved. These results lasted and were reconfirmed in a survey of the study participants four to ten months later. In-vitro experiments performed in the Oncology Institute of the Academy of Science in Kiev, Ukraine provide details of the effectiveness of bio Resonance treatment. The Nobel Assembly at the Karolinska Institute has today decided to award the Nobel Prize in Physiology or Medicine for 1991 jointly to Erwin Neher and Bert Sakmann for their discoveries concerning „the function of single ion channels in cells”. It has long been known that there is a rapid ion exchange over the cell membrane, but Neher and Sakmann were the first to show that specific ion channels actually exist. To elucidate how an ion channel operates it is necessary to be able to record how the channel opens and closes. This appeared elusive since the ionic current through a single ion channel is extraordinarily small. In addition, the small ion channel molecules are embedded in the cell membrane. Neher and Sakmann succeeded in solving these difficulties. They developed a thin glass micropipette (a thousandths of a millimeter in diameter) as a recording electrode. When it is brought in contact with the cell membrane, it will form a tight seal with the periphery of the pipette orifice (Figure 1A, B). As a consequence the exchange of ions between the inside of the pipette and the outside can only occur through the ion channel in the membrane fragment (Figure 1B). When a single ion channel opens, ions will move through the channel as an electric current, since they are charged. Through a refinement of the electronic equipment and the experimental conditions they succeeded in measuring this „microscopical” current by laborious methodological developments during the seventies. It is possible through Bio Resonance technology to send an „inverse oscillation” pattern of energy of any toxin to the body to cancel out its electromagnetic charge. This renders the toxin inert or nearly so. With little or no energy in the toxins electro-magnetic field, the immune system can easily remove the remains of the toxin from the body. 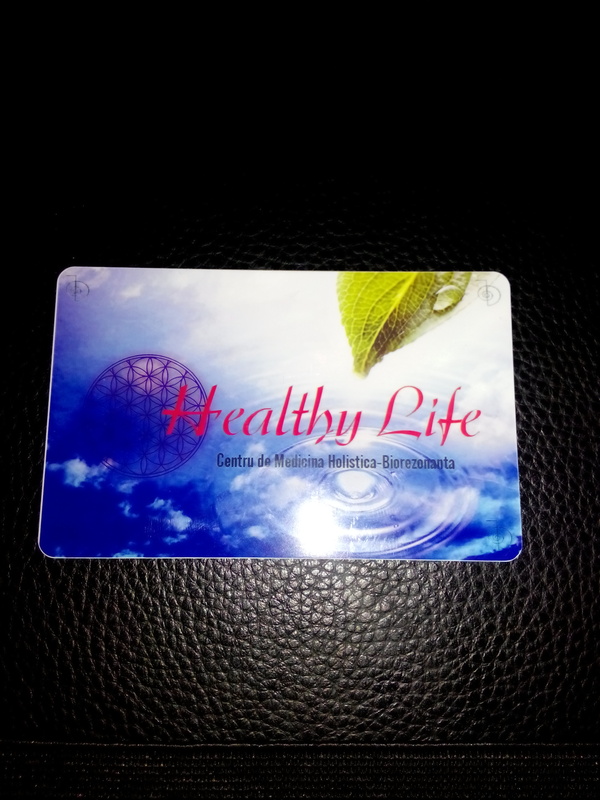 The sequence and order of these therapies is important and must be done with care in order to successfully clean the toxins out of the matrix of the connective tissue. 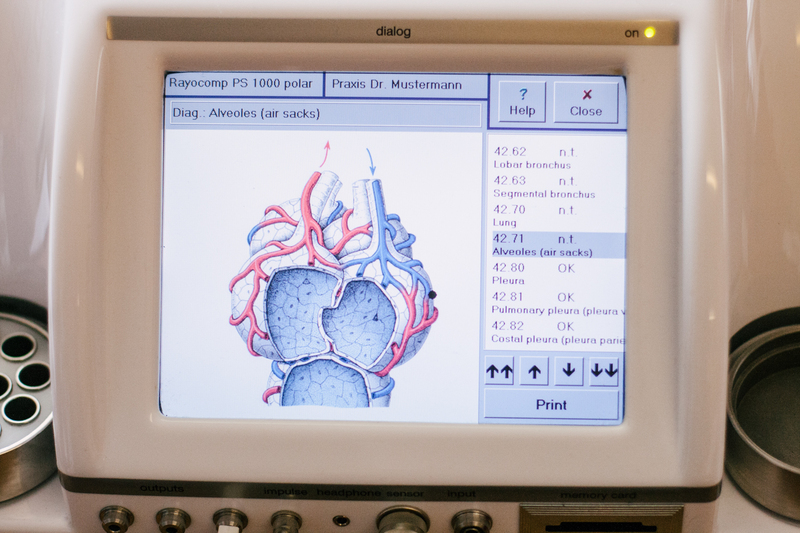 The Rayocomp Is A Bio Resonance Device – What Functions Can It Provide? back into a harmonious condition. The main use of Bio Resonance in Germany is in the field of Allergy testing and desensitising. The presence of toxins can be determined both in the body and in substances. As we have already seen every function of the human body is controlled and can therefore be influenced by frequencies. To date the Rayonex Company has supplied thousands of frequencies covering organs, emotional states, toxins, pathogens and the basic periodic table of 104 elements. Many of these frequencies are included in 54 integrated treatment programs build into their devices, others can be used as a single frequency treatment or can be written onto a ‘smart card’ to make up an individual treatment program. Three years ago the Rayonex Company in Germany commissioned a randomised double blind clinical study to establish the effectiveness of their devices*. The findings of this type of study are the criteria for scientific proof. Please request a copy of this 14 page abstract (the full report runs to several hundred pages). Are Any Special Skills Needed? No. However some people have found it far better to start off by just using the main harmonising treatment program 51 (pre control). This is the most important of the 54 integrated treatment programs. After a few sessions or maybe just one session such people invariably find they can then test either themselves or others quite easily. The electronic sensor has a wooden handle on it with a special button that when pressed to the ‘right’ moves the frequency being tested forward by one as shown on the computer screen, press to the ‘left’ and it moves it back by one, press ‘up’ to store the frequency value in the computer on a smart card and pressing ‘down’ moves to a precision mode where a frequency is tested in very small amounts i.e. .025 of a frequency – this is for very technical testing of supplements, food, products. PS Not To Be Confused With Radionics. Radionics is a method of healing, usually without physical contact with the patient, with the help of specialized instruments, in conjunction with a special faculty of extra-sensory perception (ESP). The name ‘radionics’ is somewhat misleading since this form of healing has nothing to do with radio or radiowaves, neither does it have anything to do with electronics. As a matter of fact, radionics can be said to be healing with ‘thought energy’. Only very few people have the privilege of changing the world as vigorously as Paul Schmidt has done in his time. His brilliant ideas, flowing into more than 300 granted patents, give evidence of his ingenuity and creativity. Paul Schmidt was born in Altenhundem, Sauerland, on the 31st of October, 1922. His childhood was overshadowed by the early death of his father, forcing the remaining family to lead a life in modesty and improvisation. He developed his technical skills at an early stage which finally lead him to his training in the engineering profession. His first job as an engineer had to do with the development of agricultural machinery, but then he founded his own company, Tracto-Technik. In the years of building up his enterprise, he was never hampered by his commitment to social and cultural matters, so finally he was awarded the Bundesverdienstkreuz (Order of the Federal Republic of Germany). It was his desire to help other people which made way to a basic approach in alternative medicine and finally to the bio-resonance according to Paul Schmidt. In 1982, he founded the company Rayonex Schwingungstechnik (oscillation technology), devoted to the development of new ideas for alternative medicine. Until the 2ndof August,1994, the date of his death, he remained true to his social commitment. He designed books for children and donated them to schools and kindergartens. Bio-resonance, particularly the bio-resonance according to Paul Schmidt, is easily explained with an example from nature.Surely, the oldest kind of biological resonance is our sunlight. If the sunlight touches our skin, regulations are triggered. The reason for this is not the heating up of the skin, but the share of ultraviolet rays contained in sunlight. This can only mean, the ultraviolet rays are able to encourage pigmentation. A regulation system is integrated in our skin, which starts pigmentation when exposed exactly to those frequencies found in sunlight, causing it to appear tanned. Pigmentation of the skin is only one of the regulations prompted by the sunlight, another one is the stimulation of the vitamin D production. It is not hard to understand that there are other frequencies beside this narrow frequency band of the sunlight, which also trigger off their own regulations. Way back in the year of 1976, Paul Schmidt started to realise these connections. He estab-lished the exogenous (affecting from outside) bio-resonance which bears his name today.The special emphasis of the method lies in the elimi-nation of causal health influences like geopathy, electro-magnetic pollution, bad dietary habits etc. Alone in Germany, more than 5000 physicians and alternative practitioners apply bio-resonance according to Paul Schmidt. The break-through was enabled by the high-med device of the Rayonex company, the Rayocomp PS 1000 polar. The Rayonex Schwingungstechnik GmbH in Lennestadt-Meggen employs 34 staff members at present. Because of the sharply increased demand on the export sector, with a special focus on the European and Asiatic markets, the business enterprise called for extension. Extraordinary products deserve an extraordinary presentation. Therefore, the pyramid shape was selected for the company building. After all, just like the pyramids, the bio-resonance according to Paul Schmidt still has so many secrets to uncover ? a very exciting assignment for the future. The Main Pyramid provides sufficient space for future development, production and sales. At present, the slightly smaller Event Pyramid is used for teaching, seminars, lectures and training courses for student groups from our country or abroad. On the 31st of October, the birth date of Paul Schmidt, we have planned the completion of the third pyramid. Following the holistic approach of the bio-resonance, the pyramids were built on interference-free grounds, the risk of electro-magnetic radiation for the staff was reduced to a minimum, the integration of a geothermal heating system, solar concepts and a system for recycling rainwater enssure the environment-friendly handling of precious resources. The interior of the pyramids is fully illuminated by spectral light, the work places can be adapted to individual needs where temperature, light and aeration are concerned. 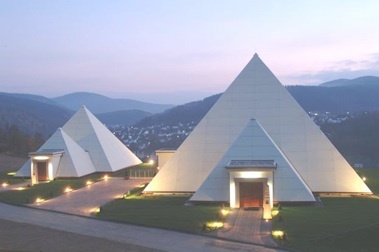 The Sauerland-Pyramids are an impressive sign for the holistic attitude of the Rayonex company, not in words alone, but also in deeds. In this way, even though business is increased considerably, modern production technology, patent rights and a quality management system according to DIN EN ISO 9001 and DIN EN 13485 assure the high quality standard of the Rayonex products. The first step back to health recovery must not necessarily be a therapy! It lies in our own responsibility to eliminate disturbance fields, thus taking the first step forward towards recovering and maintaining the wellbeing of our organism. But what kind of holistic method is suitable for finding out whether the causal disturbance is due to electro-magnetic pollution, geological disturbance fields, bacteria, viruses or parasites? What is the state of our acid-base balance? Is there a lack of minerals, trace elements or other important parts of nutrition in our organism? How can we find out whether our most important nutrient, water, has the quality our body needs? In this book, step by step and easy to comprehend, the reader comes closer to the holistic approach of the bio-resonance according to Paul Schmidt. The book is focused on the sure conversion of the written word into practice. With the help of many examples, a sound foundation of basic knowledge is established, so we can move on to the methods for testing and harmonising from here.These can be simply picked up and applied. True to the holistic approach, the causal influences mentioned before are discussed. On this basis, the book goes into detail concerning the therapeutic possibilities of the bio-resonance according to Paul Schmidt. Testing and harmonising the energy state, the body polarities and the Chakras are part of this spectrum.They are followed by solutions for recognising deficits in organ systems and restoring their equilibrium. Also, a method is introduced to face complex illnesses in all their features. We are made familiar with preparation and drug tests, allergen tests and harmonisation are introduced. 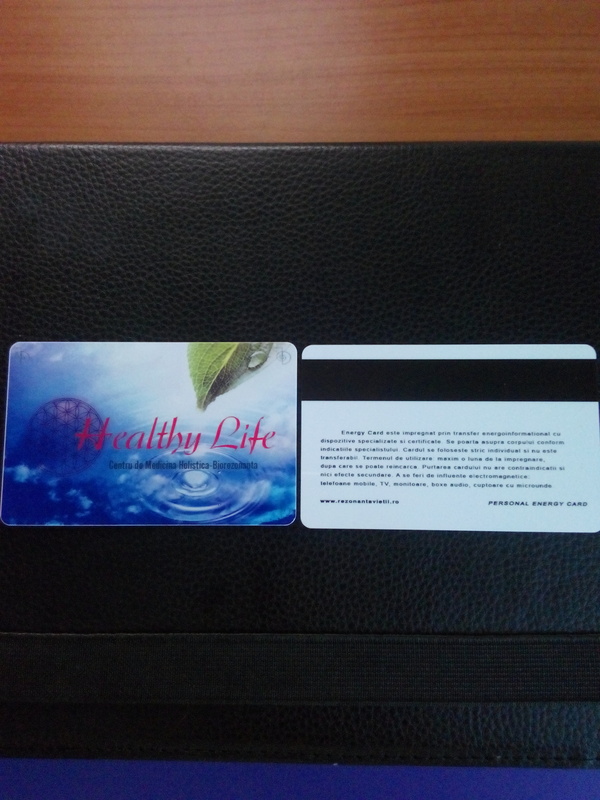 In order to include body-own substances like blood, saliva, urine etc. in the therapy concept, another focus is placed on the transfer of energetic structures to the organism or to suitable carrier substances. Finally, special areas of bio-resonance according to Paul Schmidt are under discussion. There is the acupuncture oscillation therapy for stimulating or sedating channel points using frequencies instead of needles, for instance. Also, the utilisation in veterinary medicine is introduced, the method is applied particularly to horses and dogs. A topic of special importance is the latest great development, the bio-energetic analysis and therapy method (B.A.T.) according to Manfred Denecke. This book is completed by an appendix with more than 200 pages; here you can find all lists, tables and copy patterns required for working with the bio-resonance according to Paul Schmidt.They include: frequency tables for the application in human and veterinary medicine, check-up lists, the frequency atlas of the human body, frequencies of the periodical system of the elements and such of germs, more than 30 perfected control plans of the human organism, the 14 channels with illustrations of the acupuncture points and corresponding frequencies as well as a list of the programs currently being used for B.A.T. The book is intended for members of the healing profession and their patients but also for other users and all people with a preference for holistic, gentle, alternative medical approaches. If you take a closer look at the market, you will find an extra device for each different application variation of oscillation medicine. For the user, this can only mean he has to buy a new device for each method and also provide sufficient space for every single one. The basic idea accompanying the complete development of the Rayocomp PS 1000 polar was to design a multi-functional device, a multi-talent in oscillation medicine. The solution to the task was the modular construction. A module provides the corresponding functions for a special application field of the Rayocomp PS 1000 polar. Example: basically, the Rayocomp PS 1000 polar is equipped with the module ‘Bio-resonance according to Paul Schmidt’ with all its functions. A further module is called ?Harmony with sounds of nature and music?. If this additional module is purchased, the patients can listen to harmonious sounds of nature via headphones along with the bio-resonance harmonisation according to Paul Schmidt, buying an extra device is not required. This is also valid for the acupuncture oscillation therapy, B.A.T., according to Manfred Denecke etc. The modular design is a fair offer for users. It is an economical starting device for all applications. You can build up the basic device with further modules at any time, so it can grow with the requirements of the therapist.It also allows you to integrate future modules which are still being developed at present.All these advantages turn our device into a good future-orientated investment. Many users have already profited from the possibilities of subsequent module integration. The most popular ensuing provisions are the modules for acupuncture oscillation therapy and B.A.T. according to Manfred Denecke. The consequently simple operation mode belongs to the device concept. The device is not overloaded with buttons and flashing luminous diodes, it is operated very comfortably by touch screen. The Rayocomp PS 1000 polar can effortlessly lead the user through the menus via visual information. The following picture will give you a general view of the device. With many new functions, i.e. interference analysis, many new integrated quick-tests (check-up, electro-magnetic radiation, geopathy, allergens, …), function for storing own programs and interferences. The therapy programs according to Dr. med. Elmar Ulrich and other special programs can be integrated in the device. You can keep on using your earlier memory cards completely. The new patient history is certainly another outstanding achievement. You can simply look into older sessions, analyse and repeat them if this seems promising. A different music title with corresponding sounds from nature was developed to accompany each one of the 54 integrated therapy programs of the new Rayocomp PS 1000 polar. 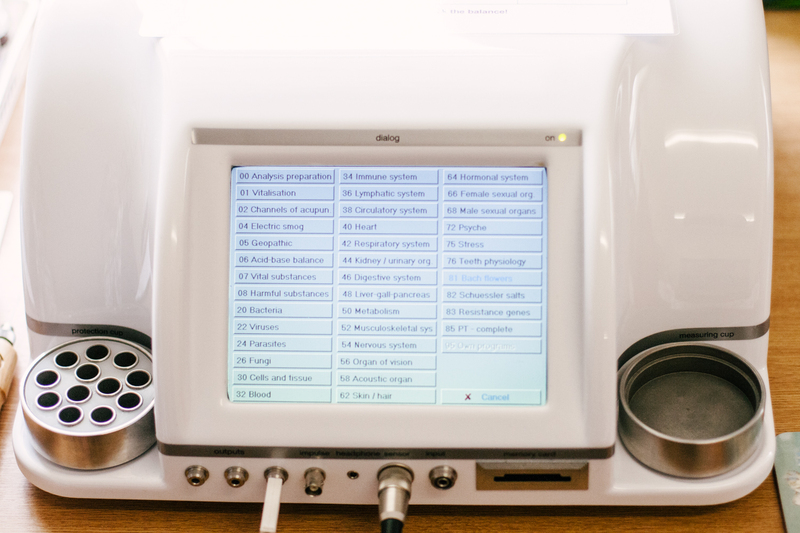 With the music, you can tune in your patients on the therapy in the best way possible or even apply the suitable acoustic waves via head-set while harmonising. With this Rayocomp module, you can carry out an acupuncture channel quick-test; based on the results, the corresponding channel pairs for harmonising can be selected. Also, every single point of a channel can be examined with the aid of a graphic display and harmonised. The discovery of an imaging method for making the acupuncture channels of the body visible was a great sensation. Dr. med. Schlebusch, a physician with practice in Essen (chairman of ZDN, Gesellschaft zur Dokumentation von Naturheilverfahren [Association for the documentation of natural healing methods]) developed the imaging method for the channels of traditional Chinese medicine (TCM) on the basis of thermographic measurements.It is amazing to see the synchronism of the channels found with our state-of-the-art technique and those of TCM, meanwhile well-known for the past 3000 years. Using a Rayocomp PS 1000 polar and the module of the acupuncture oscillation therapy, disturbed channels were tested and harmonised in the institute of Dr. Schlebusch. The two pictures show the startling results. The left picture of the test person was taken before harmonising. The right photo was made four minutes later, after harmonisation of the lung and colon channels. Now we can see the progression of the lung channel very vividly. It is really sensational to have clear evidence for the existence of the channels and also for the fact that they can be activated by means of the bio-resonance according to Paul Schmidt. With these, the frequencies of the bio-resonance device are passed on to the hand and foot circulation. The most ideal way to use the foot detectors is with bare feet. If you have a tendency towards cold feet, it may be useful to place a cushion underneath. These leather detectors, available in different lengths, can be fastened around the wrists/ankles; there is no need to hold the detectors and you are free to sit comfortably and read a book, if you like. The 70 cm long velcro detector is often used when special harmonisation of the neck or head area is required. This detector is suitable for the acupuncture oscillation therapy; its point is ideal for passing the frequencies on into the different points of the channels. It can also be used for the localisation of disturbance fields, precisely and straight to the point. The point of the spherical detector is a ball of 10 mm in diameter and can be used to harmonise scared skin, for example. Like the velcro detectors, the surface detectors are made of leather treated with natural tanning agents. A woven metal fabric is sewn in between the top and the bottom layer, which has a connection to link it to the bio-resonance appliance. Use the small surface detector to additionally apply frequencies to certain organ areas. If you want to harmonise while lying down, perhaps while sleeping at night as an intensive harmonising treatment, the large surface detector will come in handy. This is a special detector for testing allergens. The person being tested holds the protection detector and uses the concave tip to touch the glass ampoule filled with the tested allergen. A special manufacturing process makes sure that the frequencies of the allergen can enter the measuring circle, but the body-own frequencies of the tested person cannot imprint themselves onto the contents of the ampoule, which might influence future measuring. This measuring instrument, designed like a one-hand rod, was specially developed for the Rayocomp PS 1000; it is equipped with a wooden handle, thus protecting the therapist from contact with the oscillation circle of the patient. The wooden handle has an integrated operation button to enable control of the bio-resonance device while testing and harmonising. By pressing the button, for example, the next interference can be set or the current interference stored in the device for further analysis. These functions mean an enormous improvement of operation comfort and the time required for testing is cut down considerably. The accessories listed above are completed by a vast number of testing sets with all kinds of allergens, i.e. 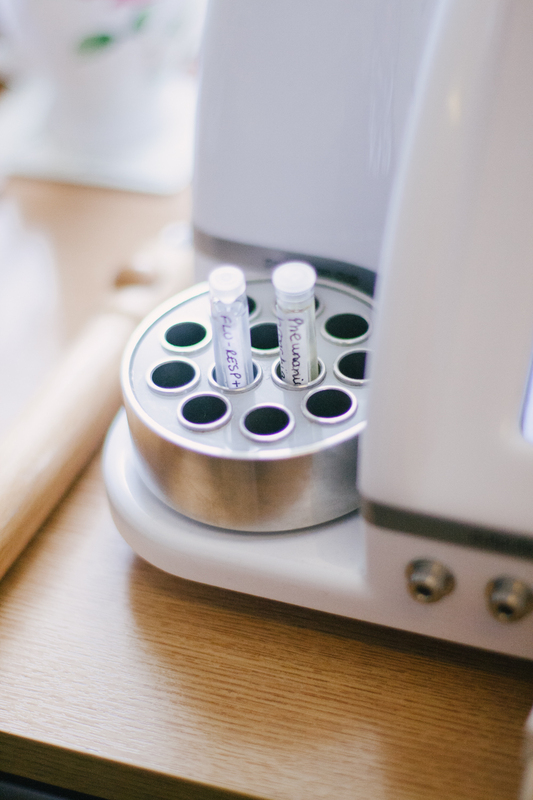 the global test set; the 70 collective ampoules with over 1000 substances can speed up the testing process considerably. Finally, the treatment table with its adjustable foot detector set-up should be mentioned. Note: The effects of bio-energetic oscillation is still neither accepted nor acknowledged by the orthodox medicine.